A music promo, usually just called a promo, is shorthand for "promotional copy." It is what the name suggests: A copy of an album used for promotional purposes. These are often sent to press and radio in advance of the release of an album to get reviews or radio play, and they are also often sent to promoters and agents when booking shows. In short, a music promo is the main ingredient in a promo package that is then used to drum up press coverage, attract record label attention and more. Promos take a few different forms. Some are simply complete copies of an album, artwork and all, that are used for promotional purposes. Sometimes a label will scribble out the barcode to try and discourage people from heading out to the record store and selling the promos. 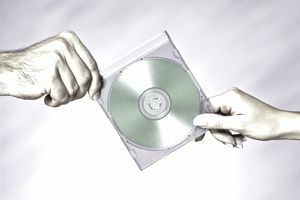 Some promos are complete albums with artwork, but with CDs printed with "promo use only — not for sale" or some other message to prevent discourage resale. Still, other promos contain a CD only in a plastic wallet without album artwork. In the case of vinyl promos, they can be "white labels" — generic pressings of the album with a white label and white sleeve. And promos can simply be self-burned CDs. Which Kind of Promo Should You Consider? There are no hard and fast rules as to which kind of promo is best. One technique is to start with the generic promos since they're the cheapest. You might consider upgrading certain people who have been supportive of the band to complete promos with artwork down the line. It's probably a good idea to have a couple of varieties of promo CDs available. Even better, if your band has a website, it's easy to upload promo versions of music files such as MP3s, which visitors can listen to. But remember that it's only a promo; don't give away every minute of every song for free. The idea is to raise interest which ultimately leads to sales. One important thing to consider as you put your promo together: Who's going to get it? You won't always be able to find just the right recipient at the label or the magazine you, but that doesn't mean you shouldn't try. You're more likely to get some kind of response if you don't fling your promo out there and cross your fingers. Try to make sure there is a specific person at the receiving end. Also be sure to keep track of what you send where, and when. If you sent a promo to a magazine and haven't heard back within two weeks, it's not a bad idea to follow up with the contact person via email or phone to make sure your promo was received. What's the Difference Between a Promo and a Demo? Be careful not to confuse promos with demos. There are certain cases where a demo is used as a promo Simply put, consider a promo to be a finished product or final version of a release, while a demo is a rough recording. Demos contain music that may someday end up on an album but may also end up being changed before a final version.